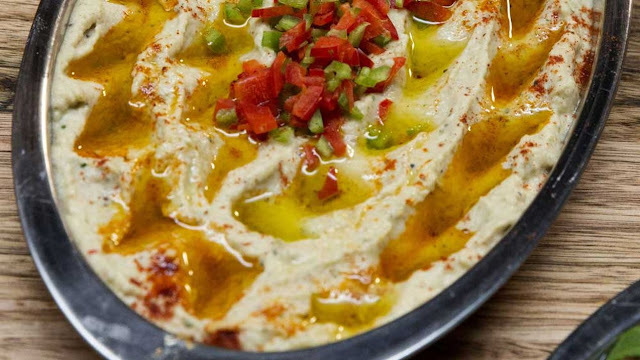 From the winning table of the Shahrouk sisters, this is the best babaghanoush you'll ever taste. 1. Place eggplants over a gas flame or charcoal grill for approximately 10 minutes, turning occasionally, until the skin has blistered and blackened. Remove from the heat, place in a colander set over a bowl and cover with a piece of plastic wrap. Leave for 10-15 minutes to cool and allow for the skin to begin to peel away. 2. Meanwhile, place garlic, mint and chilli in a mortar and pestle and grind to a coarse paste. 3. Peel the skin from the eggplant, squeeze out any excess liquid and roughly chop flesh. Place into a food processor along with tahini, lemon juice, garlic paste and salt to taste. Puree until smooth and creamy. 4. To serve, spread over a large, shallow serving bowl. Garnish with pomegranate seeds, mint leaves and drizzle with some extra olive oil. - To make a less spicy version, remove the seeds from the chilli. - For a great smoky babaghanoush, it is essential to cook over a gas flame stove top or even better a charcoal barbecue to give an added smokiness. - This dip is served as a mezze dipping plate on many Lebanese family tables. It is a perfect accompaniment to berbecued meat, chicken, kofta and also vegetarian banquet. A dollop of Greek yogurt gives an additional creamy texture and freshly hulled pomegranate seeds are perfect for garnishing with fresh mint and olive oil.